The discovery of nine new transiting exoplanets is announced today at the RAS National Astronomy Meeting (NAM2010). When these new results were combined with earlier observations of transiting exoplanets astronomers were surprised to find that six out of a larger sample of 27 were found to be orbiting in the opposite direction to the rotation of their host star — the exact reverse of what is seen in our own Solar System. The new discoveries provide an unexpected and serious challenge to current theories of planet formation. They also suggest that systems with exoplanets of the type known as hot Jupiters are unlikely to contain Earth-like planets. “This is a real bomb we are dropping into the field of exoplanets,” says Amaury Triaud, a PhD student at the Geneva Observatory who, with Andrew Cameron and Didier Queloz, leads a major part of the observational campaign. Planets are thought to form in the disc of gas and dust encircling a young star. This proto-planetary disc rotates in the same direction as the star itself, and up to now it was expected that planets that form from the disc would all orbit in more or less the same plane, and that they would move along their orbits in the same direction as the star’s rotation. This is the case for the planets in the Solar System. After the initial detection of the nine new exoplanets  with the Wide Angle Search for Planets (WASP, ), the team of astronomers used the HARPS spectrograph on the 3.6-metre ESO telescope at the La Silla observatory in Chile, along with data from the Swiss Euler telescope, also at La Silla, and data from other telescopes to confirm the discoveries and characterise the transiting exoplanets  found in both the new and older surveys. Surprisingly, when the team combined the new data with older observations they found that more than half of all the hot Jupiters  studied have orbits that are misaligned with the rotation axis of their parent stars. They even found that six exoplanets in this extended study (of which two are new discoveries) have retrograde motion: they orbit their star in the “wrong” direction. “The new results really challenge the conventional wisdom that planets should always orbit in the same direction as their stars spin,” says Andrew Cameron of the University of St Andrews, who presented the new results at the RAS National Astronomy Meeting (NAM2010) in Glasgow this week. In the 15 years since the first hot Jupiters were discovered, their origin has been a puzzle. These are planets with masses similar to or greater than that of Jupiter, but that orbit very close to their suns. The cores of giant planets are thought to form from a mix of rock and ice particles found only in the cold outer reaches of planetary systems. Hot Jupiters must therefore form far from their star and subsequently migrate inwards to orbits much closer to the parent star. Many astronomers believed this was due to gravitational interactions with the disc of dust from which they formed. This scenario takes place over a few million years and results in an orbit aligned with the rotation axis of the parent star. It would also allow Earth-like rocky planets to form subsequently, but unfortunately it cannot account for the new observations. To account for the new retrograde exoplanets an alternative migration theory suggests that the proximity of hot Jupiters to their stars is not due to interactions with the dust disc at all, but to a slower evolution process involving a gravitational tug-of-war with more distant planetary or stellar companions over hundreds of millions of years. After these disturbances have bounced a giant exoplanet into a tilted and elongated orbit it would suffer tidal friction, losing energy every time it swung close to the star. It would eventually become parked in a near circular, but randomly tilted, orbit close to the star. “A dramatic side-effect of this process is that it would wipe out any other smaller Earth-like planet in these systems,” says Didier Queloz of Geneva Observatory. Two of the newly discovered retrograde planets have already been found to have more distant, massive companions that could potentially be the cause of the upset. These new results will trigger an intensive search for additional bodies in other planetary systems. This research was presented at the Royal Astronomical Society National Astronomy Meeting (NAM2010) that is taking place this week in Glasgow, Scotland. Nine publications submitted to international journals will be released on this occasion, four of them using data from ESO facilities. On the same occasion, the WASP consortium was awarded the 2010 Royal Astronomical Society Group Achievement Award. The current count of known exoplanets is 454. 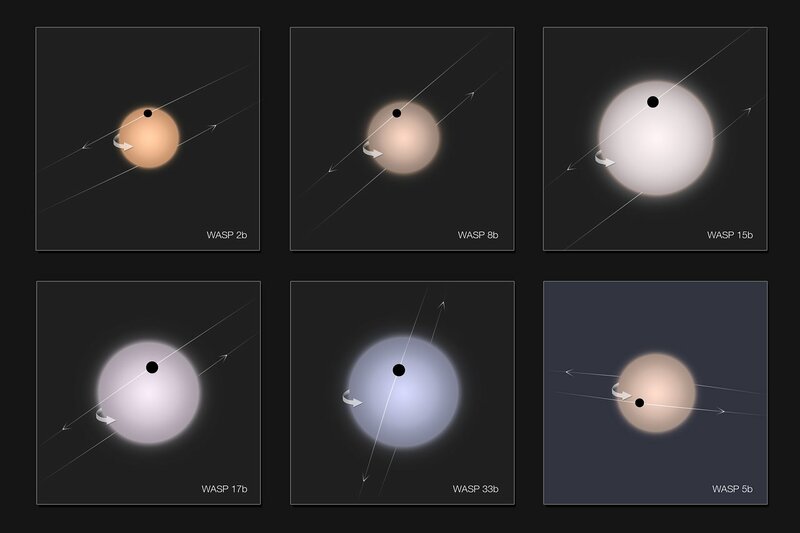 The nine newly found exoplanets were discovered by the Wide Angle Search for Planets (WASP). WASP comprises two robotic observatories, each consisting of eight wide-angle cameras that simultaneously monitor the sky continuously for planetary transit events. 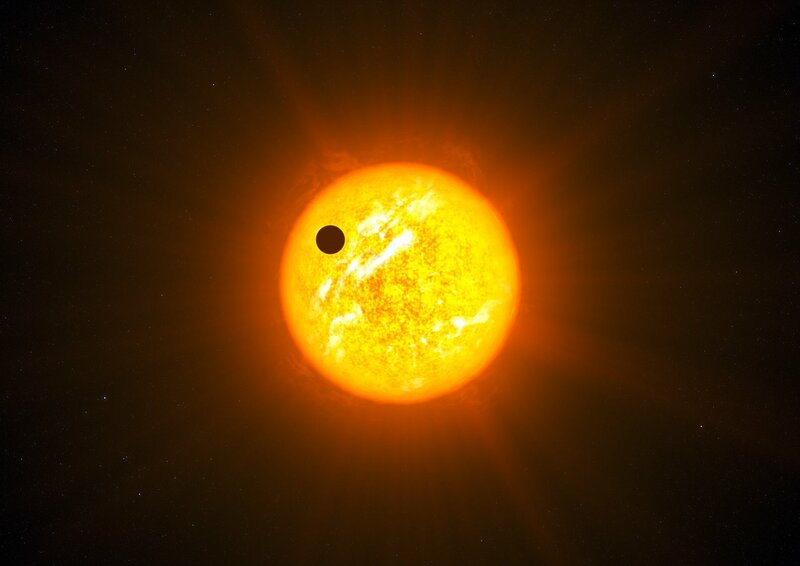 A transit occurs when a planet passes in front of its parent star, temporarily blocking some of the light from it. The eight wide-angle cameras allow millions of stars to be monitored simultaneously to detect these rare transit events. The WASP cameras are operated by a consortium including Queen’s University Belfast, the Universities of Keele, Leicester and St Andrews, the Open University, the Isaac Newton Group on La Palma and the Instituto Astrofisica Canarias. To confirm the discovery and characterise a new transiting planet, it is necessary to do radial velocity follow-up to detect the wobble of the host star around its common centre of mass with the planet. This is done with a worldwide network of telescopes equipped with sensitive spectrometers. In the northern hemisphere, the Nordic Optical Telescope in the Canary Islands and the SOPHIE instrument on the 1.93-metre telescope at Haute-Provence in France lead the search. In the south, the HARPS exoplanet hunter attached to the 3.6-metre ESO telescope and the CORALIE spectrometer on the Euler Swiss telescope, both at La Silla, were used to confirm the new planets and measure the angle through which each planet's orbit is tilted relative to its star's equator. The robotic Faulkes Telescopes of the Las Cumbres Observatory, located in Hawaii and Australia, provided the brightness measurements that determined the sizes of the planets. Follow-up observations of WASP exoplanet candidates are obtained at the Swiss Euler Telescope at La Silla, Chile (in collaboration with colleagues at Geneva Observatory), at the Nordic Optical Telescope on La Palma, and at the 1.93-metre telescope of the Observatoire de Haute-Provence in France (in collaboration with colleagues at the Institut d'Astrophysique de Paris and the Laboratoire d'Astrophysique de Marseille). The studies of the orbital tilt angles of the WASP planets were made with the HARPS instrument on the ESO 3.6-metre telescope and with the CORALIE instrument on the Euler Swiss telescope, both at La Silla in the southern hemisphere, and at Tautenburg Observatory, McDonald Observatory and the Nordic Optical Telescope in the northern hemisphere. Hot Jupiters are planets orbiting other stars that have masses similar to, or greater than, that of Jupiter, but that orbit their parent stars much more closely than any of the planets in our own Solar System. Because they are both large and close they are easier to detect from their gravitational effect on their stars and also more likely to transit the disc of the star. Most of the first exoplanets to be found were of this class. ESO, the European Southern Observatory, is the foremost intergovernmental astronomy organisation in Europe and the world’s most productive astronomical observatory. It is supported by 14 countries: Austria, Belgium, the Czech Republic, Denmark, France, Finland, Germany, Italy, the Netherlands, Portugal, Spain, Sweden, Switzerland and the United Kingdom. ESO carries out an ambitious programme focused on the design, construction and operation of powerful ground-based observing facilities enabling astronomers to make important scientific discoveries. ESO also plays a leading role in promoting and organising cooperation in astronomical research. ESO operates three unique world-class observing sites in Chile: La Silla, Paranal and Chajnantor. At Paranal, ESO operates the Very Large Telescope, the world’s most advanced visible-light astronomical observatory and VISTA, the world’s largest survey telescope. ESO is the European partner of a revolutionary astronomical telescope ALMA, the largest astronomical project in existence. ESO is currently planning a 42-metre European Extremely Large optical/near-infrared Telescope, the E-ELT, which will become “the world’s biggest eye on the sky”.